Take the law into your own hands and bring justice to the streets. 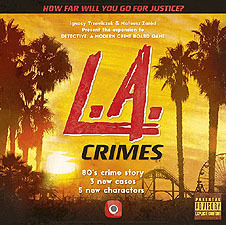 It's the 80s and Los Angeles is swarming with corruption, narcotics, and crime. A unique case has presented itself, however it needs a detective who isn't afraid to do what's necessary. If that's you, then join L.A.P.D. and solve crimes under the leadership of James Bradley! This expansion includes three new cases that create one exciting campaign. L.A. Crimes introduces new playable characters and new mechanics into the base game of Detective: A Modern Crime Board Game. You will be running surveillance to learn more about the suspects and accumulating stress much faster when deciding to break protocols in order to get criminals behind bars! 3 NEW CASES TO SOLVE! online content, including introductions to the cases, as well as database entries and documents. A base game is required to play. Note: Contains strong language and depictions of violence.